Austrian company Königseder again prepared for us something new and this time it is american whopper Chrysler. At first sight is an exclusive car. Comfortable decent shapes, not obtrusive and not too technical. 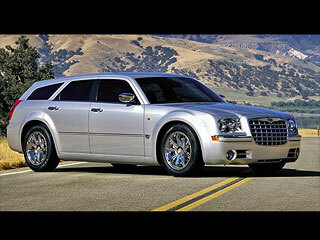 Elegant limousine suitable also for sports loving people. Simply, design like it should be. Nouble elements of exterior connect also an interior. Materials are in the best quality and the fabric makes impression of handcraft and the interior affect comfortable. Optimal choice was develop three motors and two gearboxes. Furcate six cylinder car with capacity 2.7 l opens up to model 300C exelent combination of driving with low burnup fuel, quiet engine and lifespan. Furcate six cylinder car with capacity 3.5 l is also in disposition. 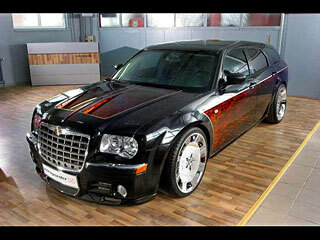 Chrysler 300C reaches the highest power with furcate eight cylinder HEMI Magnum with displacement 5.7 litres. Gearboxes were chosen to motors, for the best combination of power, sophisticated running and economy. Well- tried five speed automatic gearbox DaimlerChrysler with manual control AutoStick in automobile Chrysler is found in the first time and standardly is combinated with engine 5.7l V8 HEMI Magnum. Undercarrige of Chrysler 300C is constructed so, it is guaranted save, luxury drive, simple and easy control of car. We should not talk to much and have a look at real beauty. Chrysler 300C already in serial state has something to say, but after tuning from Königseder - it is simly delicacy. Like a showcar chose real monstrum 5.7l eight cylinder car HEMI with all-wheels drive. That is not all, there is also a combi version. Under the front bumper "moved" spoiler with small air holes into the front brake wheels. Holes are covered with air grate. Under the back bumper goes two - part spoiler consist of right and left side and create two masive tail pipes. We can not forget the undercarriage kit from KW and the realy beautiful chrome disc Gannielle Mass-8 in dimension 9 x 22 and 10,5 x 22. Nice dimensions, what do you say? And the cherry on the cake is airbrush, which in any case belongs to american classic. Imitation of flame in black metalic polish looks realy good. What else we could add. Königseder again proved, that belongs among home elite and it does not do any problems with cheaper well-known serial cars like is Chevrolet Kalos, and with expensive reconstructive limousine, like is e.g. Chrysler 300C. The firm KÖNIGSEDER was established in 1987, when it started with development, production and design high quality spoilers and plastics, mainly for european marks like AUDI, BMW, FIAT, HONDA, OPEL, PEUGEOT, RENAULT, VW and so on. They started in a small garage in a small town called Eferding. In 1992 they had to move to larger area to town Bad Hall. In that year started the first own project like e.g. study of car BMW Mini Cabrio. In 1994 firm had to move again to larger areas. Own design and constructive department was established in firm KÖNIGSEDER in 2001.From that moment they provide everything on they own from the first design to final products and serial production. Do you like this Chrysler 300c tuning by Königseder?